Re-infesting fleas are killed within 2 hours with protection against further flea infestation lasting 8 months. *Seresto® is water-resistant and remains effective following a shampoo treatment, swimming or after exposure to rain or sunlight. Under normal conditions, effectiveness lasts for 8 months. In order to maintain an eight-month duration, dogs must not be bathed more than once per month. For dogs that swim once a month or more, the control duration is reduced to 5 months for flea control and reduced to 7 months for tick control. 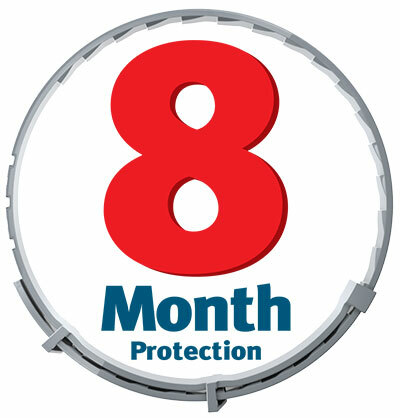 The collar should be worn continuously for the 8 month protection period. Check periodically and adjust fit if necessary, especially when puppies are rapidly growing. Rarely, mild application site reactions may occur, such as scratching, redness and hair loss, which usually recover within 1-2 weeks without the need for collar removal. In some cases, temporary collar removal and bathing may be recommended until symptoms have disappeared. In very rare cases, application site reactions, such as dermatitis, inflammation, eczema or lesions may occur. In these instances, immediately. If your animal is on medication, consult your veterinarian before using this or any other product. For external use on dogs only. Do not use on other animals. Do not use on puppies under seven weeks of age. Do not get this product in dog's eyes or mouth. As with any product, consult your veterinarian before using this product on debilitated, aged, breeding, pregnant, or nursing animals. Individual sensitivities, while rare, may occur after using ANY pesticide product for pets. The Bayer Polymer Matrix System ensures that both active ingredients are slowly and continuously released in low concentrations from the collar towards the animal. This avoids peak concentrations and ensures that concentrations of both active ingredients are present in the dog's hair coat during the entire efficacy period. The active ingredients spread from the site of direct contact over the entire skin surface. Seresto™ -- how does it work?